Would you believe Atchison Topeka & Santa Fe 92 has been in IRM’s collection for 20 years now? This EMD FP45 was built in December of 1967 with frame number 5731-3. It was donated to the museum in May 1997 by the BNSF railway, along with BN1, BN2, and BN3. In the first several years at the museum, 92 was on display in a prominent spot in Yard 5 at the corner of Depot Street and Central Avenue. Visitors could take a tour of the cab and the engine room on most days. Santa Fe 92 did not operate when it was donated. At the time, Diesel Department volunteers did not look into the locomotive in much detail. IRM was told the engine in 92 had been swapped with a freeze damaged engine from a SD45. It was put on static display with the thought that maybe it could operate sometime in the future. By 2010, enough money had been donated and secured to pay for indoor track space for 92. Equipment at IRM must pay for the space on the track it occupies outside, and must also pay the cost of the building space that it occupies inside. Indoor storage is the first step in the long term preservation of any rail equipment. The 92 was moved out of Yard 5 and into Barn 2 early that year. The elements outside were very harsh and did a number to the red paint on the 92. Luckily a little bit of cleaning with lacquer thinner did a wonderful job to brighten it up. Later in 2010 the numbers on the side of the cab were freshened up as they were faded badly. 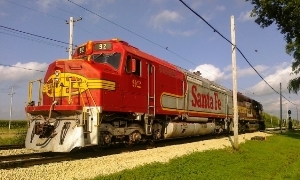 The 92 had been renumbered from 101 when the ATSF GP60’s were introduced in the 100 series. Also in 2010, it was decided to try to use the 92 as a control cab, basically use it as a lead loco with a unit MU’ed to provide the propulsion power. The air brake system and electrical control system was gone through in detail, along with the running gear below deck, and all made to work for that purpose. There is a video here of the 92 leading a run-by on the museum’s demonstration railroad. Moving all the way to December of 2016, Diesel Department volunteers had planned a trip to National Railway Equipment in Silvis to look at a number of parts that they had available for some other projects being worked on in the department. While walking through the shop, shop workers were removing the major components from an ex SP SD45. On the way out, inquiries were made about the price of the 20 cylinder 645 that they were removing… they were firm at $25,000. It was considered for about four seconds before deciding it was just too much. Just after the new year in 2017, NRE had come back to IRM about another RTO 20-645E3 that they had in stock, offered at $12,000. Now that prompted many discussions about the project overall and what all the ATSF 92 would really need to make it operable again. Would it need an entire engine change? Should IRM try to repair the freeze damaged engine that the 92 had, using some power assemblies acquired many years ago? And the big question, what else does it need? Over the next few months IRM volunteers began going through everything in 92 in detail. It was clear the engine did have major freeze damage. The advice from those in the industry was to replace the engine. It was already known that 92 was going to need a new air compressor. In the end, the list of major mechanical items needed to make the 92 operable again are the 20-645E3 engine, the AR10, and the WBO air compressor. A few significant donations to the ATSF 92 restricted fund, along with some department discretionary funds, made this portion of the project possible. A few other items on the list that are two wheelsets that are good, but not quite enough tread left to allow for another cut. The other four have enough tread for a cut and then some. The last major item is the truck frames, the current Flexicoil trucks are also from a SD45 and have the low underslung brake cylinders. To make the 92 correct, it would need the four high mounted brake cylinders on the Flexicoil trucks.